Solar inverter costs, warranties, and efficiencies you should know before making your purchase. 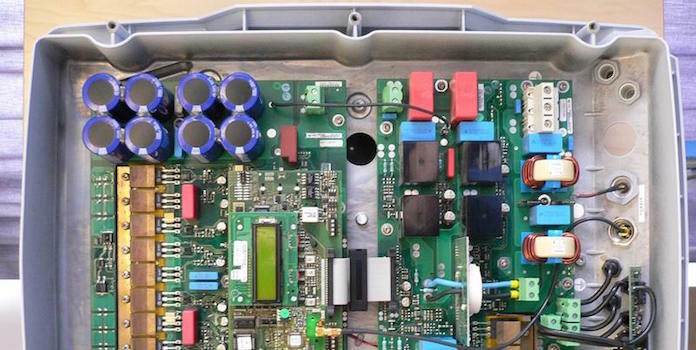 Quick Tip: If you’re not too familiar with solar inverters, glance over our primer on solar inverters What Solar Power Inverter Should You Get For Your PV System? to understand the basics before moving forward with this article about solar inverter costs. If you are already working with a solar installer, most have a short list of inverters they typically like to install, so your options for inverters might be somewhat limited. Which inverter is installed in your home is typically decided by availability and installation size as well as placement of your solar installation (see the article linked above for more information on this). Even if your installer has shortlisted a few inverters to make it easy for you to choose, or even if they already chose for you, it’s a good idea to know a little the technology and typical solar inverter costs so you know what you are getting and whether it’s a good deal. There are a lot of inverters out there, each with different prices, efficiencies, and warranties, so knowing a little background information will go a long way to helping you make a sound financial decision. If you’ve got the itemized list, great! You know how much they are charging for your inverter. But how much should an inverter cost? Well, we’re here to help! The good news is that, because of their size, solar installers are able to place huge orders for inverters, solar panels, and all the other associated hardware. This allows them to get the lowest prices possible and typically much cheaper than you or I could find on the internet or in stores. For an average-sized installation, inverters typically range between $1000 and $1500. That cost can go up quickly though as the installation gets bigger. Each year, the National Renewable Energy Lab performs a cost benchmark of the solar industry, looking at average installation costs, inverter and panel costs, and a host of other related topics. In early 2016 (the latest report available), they found that solar inverters usually cost around $0.18 per watt, though they range from a high of about $0.27 to a low of $0.09. At the average $0.18 per watt and with the average installation costing $2.93 per watt, inverters usually account for about 6% of total installation costs. This means that a typical 5.6-kilowatt installation costs $16,408 in total and the inverter should account for about $1,000 of that. If your inverter was on the higher end – say $0.27 per watt (about 9% of total cost) – your inverter would cost about $1,500. Quick Tip: Larger solar installations require larger, more expensive inverters (and vise-versa). However, you can quickly calculate if your installer is grossly overcharging (or undercharging) you by multiplying your installation size (in watts, ie 5600 watts) by the average inverter cost ($0.18/watt). This will give you a benchmark to compare your own inverter cost to. So, for example, an inverter for a 10 kW installation should cost around $1,800. For a 17 kW installation, the inverter should cost around $3,060. Keep in mind this is an average cost. American-made inverters, micro-inverters, and high-efficiency inverters all come at a premium price. If your inverter accounts for more than 8% to 9% of your total installation cost, be sure to talk to your installer to see what’s going on. It’s possible that they’ve streamlined their sales or installation process, so instead of the inverter being too expensive, it’s just the opposite and their other installation costs (labor, panels, etc) are just lower than others. In this case, the inverter’s higher percentage of the total cost is actually good news for you (if they’re still installing quality equipment). What If I Buy the Inverter Myself? 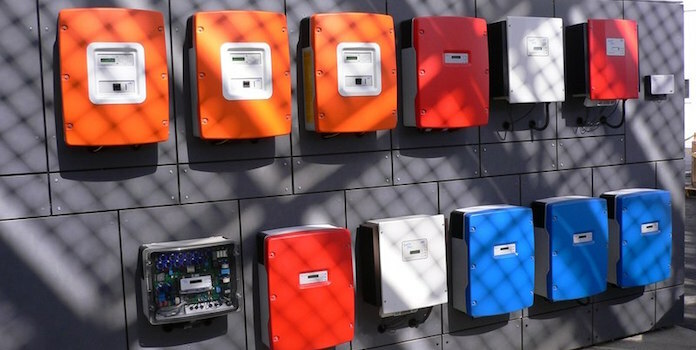 If you want to buy your own inverter you certainly can, but keep in mind that since you’ll only be purchasing a single inverter – not a bulk order like solar companies – you’ll likely pay a higher price. As you can see, even the cheapest inverters are higher than the 6% average above. Any products –no matter what kind- are always going to be more expensive when sold directly to the public. If you are installing yourself, you likely aren’t going to save money on equipment, but rather by avoiding paying for all the ‘soft costs’ installers sneak into your total installation cost: labor, sales, and marketing, operations expenses, real estate rentals, etc. By avoiding those costs, you’ll save quite a pretty penny. Inverters – with an estimated life of around 12 to 15 years – they don’t last nearly as long as solar panels, which last 25 to 30 years. Odds are that sooner or later your inverter will need to be replaced. If you lease your installation or finance it through a power purchase agreement (PPA), just call up your solar installer and they’ll come out and replace the inverter at no cost to you (since technically they own the installation). If you paid cash or financed through a loan, the responsibility to replace that broken inverter falls on you. This is where the importance of a warranty’s term length comes in. ABB inverters come with a 5-year parts and labor warranty. SMA inverters are similarly priced to ABB, but they offer a 10-year warranty on its SunnyBoy inverters. SolarEdge offers even more with a 12-year warranty! Knowing your manufacturer has your back with a long-term warranty like SMA or SolarEdge can be worth a premium cost, so be sure to review and assess all warranty policies to know both the length and what’s covered. Inverter efficiency is a measure of how much of the direct current electricity that goes into the inverter can be converted to alternating current to be used in the home or in the utility grid. Modern inverters are ultra-efficient – both the ABB and SMA inverters above are about 97% efficient. Generally speaking, cheaper inverters will see cheaper efficiency. If you find an incredible deal on an inverter, be sure to look at its efficiency (as well as the other considerations listed here) to assure yourself it’s actually a smart move. Anything can work great for a year, but what about in 5 years? Or 10 years? How about 15 years? Warranties can give you some idea of the build quality of a product – the longer the warranty, the more the manufacturer trusts their own product, right? To really get a sense for how specific inverters do over the long term, be sure to read over reviews from actual owners. Do they last forever, or is there a pattern of burn-outs just after the warranty is expired? Does an expensive component seem to break fairly quickly? Watch for patterns in the reviews. If most people are saying the same thing – whether good or bad – be sure to take it into consideration. By reading reviews you can also get a feel for the company’s customer service as well. Do they offer exceptional customer service or are they slow to communicate? Do they fight you at every turn or are they willing to go the extra mile to help you? When deciding on an inverter, cost is always the first thing we’ll look at, but be sure to evaluate its efficiency, warranty, and reviews as well. At around 6% of an installation’s total cost, inverters aren’t cheap so you need to make sure you’re getting a good product before moving forward. And when you are talking with installers and receiving estimates, do some quick math to make sure all the costs add up. Knowledge is key! Did we leave any important considerations out? Let us know in the comments!